The empty lot next to our modest hostel accommodations was on fire. 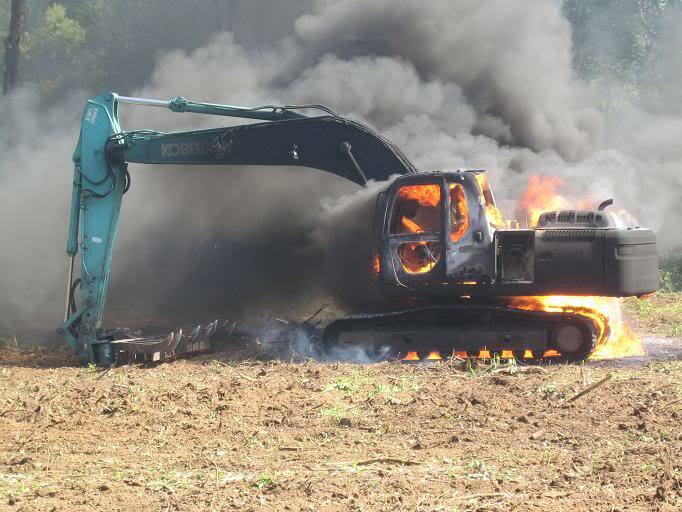 Or, more accurately, the large industrial excavator in the middle of that empty lot was on fire – engulfed in black smoke and flame. This time last year I had just arrived in Taipei with three other chaperones and 16 teens. We had just schlepped our bags through the steamy back streets and narrow alleys of a seedier part of town only to find that we would be bunking next door to the city’s next “911” call (or whatever the equivalent is in Taiwan). I rounded up my charges and we found a 7-Eleven to buy “dinner” before crashing. Never before have I been so tired. Jet-lagged, running a fever, and then this. Luckily when we returned the fire was out, the smoke had cleared, and our hostess cheerfully assured us that there was no reason for further alarm or concern. We found our way into our rooms – two large semi-private spaces split neatly in half by a platform loft about 4 feet off the ground. Mattresses were scattered haphazardly on the floor and on the plywood of the loft. I stepped over an unnaturally large spider, found a mattress, pulled a sleeping bag over my head, and fell fast asleep sure in the knowledge that as tired as we all were, no trouble could possibly come of my 16 youths. Later in the trip we would find accommodations that made this seem like the Ritz and we would have adventures that made this seem tame in comparison. We were pilgrims, off the beaten path and far from home, and we were in search of an encounter with the Holy. A year later I continue to hear stories of how that trip and experience touched and engaged the lives of 16 young people (and four adults too) and what will be gained from being a pilgrim is only just beginning to emerge. For our own missionaries, youth from St. John’s and Holy Apostles, serving the mission of God in White Earth this week, I expect that similar things are afoot. I expect that the unexpected stories, the unplanned adventures, and new encounters are planting seeds of lasting significance in their lives and in their faiths. I hope we will inquire about all of it when they return. If you see Madeline, Cooper, Rachel, Lucy, or Johannah this summer or fall, be sure to ask them about the stories of what they saw and did while away. Chances are you’ll hear something that could impact your own faith, and in listening, you will deepen theirs. “The real world isn’t like college. It was a tough evening, the reunion of my high school graduating class from the ‘60’s at Sibley High School in West St. Paul, gathered last weekend at Mendakota Country Club in Mendota Heights. It truly was like being back in high school, which for me, wasn’t exactly a bed of roses. The elite kids (we used to call them The Clique) were still seated at their own table, as we lesser types took turns paying court. The goofballs were more subdued but still hadn’t grown up. The drinkers hovered near the bar, and several of the Pretty People (including numerous beauty queens – our class had a lot of tiara power) were still pretty indeed. Where I fit in puzzled me as much as it ever did. Hello? Really? Did all the divorced people stay home? What did you do between marriage and grandparenthood? Didn’t the Recession hit anyone but me? Granted only a third of my class of 300 was there, but my outcast buttons were pushed and blaring. I had come there with my best friend from high school, Pam, and her husband, and after three of four wonderful conversations with people I really wanted to see, and the dinner and “program” (which consisted reading aloud the names of the 10% of our class who had died), I left early. I get an A on that one. I went to a luncheon the next day with some of my old girlfriends that helped fill in the blanks: I learned that many in my class had struggled with or died of cancer; a beloved child had been killed in a car accident at age fifteen; mental illness was taking a toll; varieties of disappointments happened and dreams were deferred. Of course, no one would write about this in a booklet, for goodness sake. I started to feel compassion for my classmates, and for myself, who had all, I am sure, struggled in some way or other. We are so quick to judge, to assume, to categorize. To compare how we’re “doing” to others (based on our surface observations). We can waste a lot of time making these assessments. My classmates and I, by God’s grace, are still married or not, working or not, grandparenting or not, traveling or not, financially secure or not, but we have survived and are present in the world in all of our diversity, obnoxiousness, and glory. Yay, us. Go,Warriors. The Church, like all institutions, has it’s problems. Even St. John’s – vibrant and healthy though it is – has it’s problems. It can be easy to focus on the problems. The moment of Pentecost that we have just observed as a church calls us to refocus on the presence of something incredible – the Spirit of the Living God – in our midst and out in the world, beckoning and calling us to serve and teach and preach the good news of God to the ends of the earth. But, don’t take my word for it. This excellent video shown at last fall’s clergy conference says it better than I can. Apologies to the vestry who’ve had this dropped on them once (at least) before. (make sure you have sound on your computer, and 3 minutes to spare). Ever since he was the vicar at a Twin Cities parish, I have admired The Rev. Steve Charleston. A member of the Choctaw nation in Oklahoma, he was a pioneer in developing programs in Native American studies at colleges and seminaries across the country. He went on to be elected Bishop of Alaska (on the first ballot), professor and dean of Episcopal Divinity School in Massachusetts, and recipient of numerous accolades and awards. He is the best preacher I have ever heard, someone whose authority and faith I accept unquestioningly the minute he begins to speak. If you are a member of Facebook, I suggest you “friend” him and receive his daily meditations. It is a tremendous gift you can give yourself. Some of his writings are also available in other forms: books, articles, internet.